We are open for business Monday through Thursday, from 8:00 am to 4:00 pm, Pacific Standard Time. We accept Visa, Mastercard and Discover credit cards. Your credit card will not be charged until your order leaves our warehouse. You may also prepay your order or have it shipped COD. Certain restrictions apply. We have a fax order form that can be downloaded and printed, then faxed to us. To go to the fax order form, click here. Fax orders should be faxed to: (805) 466 - 4782. This service is available 24/7. Along with your order, please be sure to include your name, telephone number, fax number and email address. Orders faxed to us on weekends or holidays will be processed the following workday. We welcome and have been serving international customers for over 20 years. We recognize the extra care that your order requires. Your international orders may be faxed, emailed, or telephoned in to 805.466.9261. Due to the special attention required by international orders, there is a $10.00 processing fee added to each order. We know your time is valuable and we know you want your parts as quickly as possible. If you place your order by 3:30 pm, PST, and your parts are in stock, every effort will be made to ship the following business day. Orders ship UPS Ground Or USPS which ever will provide the best service to your area. Large items such as Fiberglas and over sized orders may whip via Truck freight. Shipping charges are at our cost plus a $5.95 handling fee per order to cover professional packing and packing materials. If applicable, there is also a $7.50 charge on COD orders. To save on shipping fees and time, we also drop-ship from third-party resources (normally the manufacturer). Drop-ship orders may be conveyed by other carriers and will be charged at the price we are charged by the third-party. Items will be charged to at the time the order is placed with the third-party resource, and shipping will be charged when the item is shipped. In the case that a item you order is no longer available we will fill the rest of your order and refund for the part that we could no longer get. If a item goes on back order we will hold the order until we can complete it and ship it to you. For your Corvette parts in California most shipments will be delivered the next day via UPS, in most cases. We back everything we sell with our special Assurance of Quality. For every product that you order (excluding special order items and electrical parts), we offer a 30-day return period, for any reason whatsoever. We do NOT accept returns on any products after 30-days! Does Corvette Pacifica pay the return shipping cost for returned products? No, Corvette Pacifica does not pay the return shipping cost for returned goods. 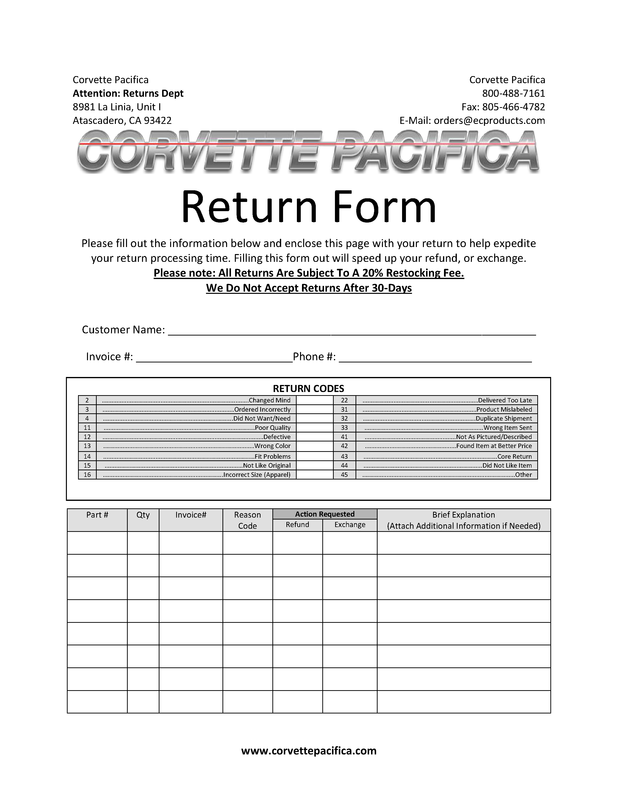 However, if you pay to send a defective item back to CorvettePacifica.com, we will replace the item and ship the replacement to you at no charge. Corvette Pacifica will utilize every resource it has to ensure that your item is replaced promptly, without hassle. Please be sure to inspect your package directly upon receipt. If it has been damaged in transit, save all the original packaging material and notify the carrier immediately. Be sure to also notify our customer service department. All prices, part numbers, specifications, terms and policies are subject to change without notice. The liability of Corvette Pacifica is limited to the replacement of defective or incorrect parts. We will pay UPS Ground shipping in this case. Corvette Pacifica is not liable for any damage or loss caused by delays, failure, or any consequential damage arising from any cause whatsoever, or for labor, towing, storage, transportation, or any other charges incurred in the replacement or repair of a defective item. Further, in order for any warranty to be considered in force, the part must not have been altered in any manner. Please read these Terms and Conditions ("Terms", "Terms and Conditions") carefully before using the www.ecproducts.com website (the "Service") operated by EC Products Design ("us", "we", or "our"). The Service and its original content, features and functionality are and will remain the exclusive property of EC Products Design and its licensors. The Service is protected by copyright, trademark, and other laws of both the United States and foreign countries. Our trademarks and trade dress may not be used in connection with any product or service without the prior written consent of EC Products Design. EC Products Design has no control over, and assumes no responsibility for the content, privacy policies, or practices of any third party web sites or services. We do not warrant the offerings of any of these entities/individuals or their websites. You acknowledge and agree that EC Products Design shall not be responsible or liable, directly or indirectly, for any damage or loss caused or alleged to be caused by or in connection with use of or reliance on any such content, goods or services available on or through any such third party web sites or services. orders@ecproducts.com and we will promptly remove you from ALL correspondence.